Quit paying rent, and start owning in Steamboat! Close to downtown, 100 ft from the free bus stop, and one of Steamboat's lowest HOAs. 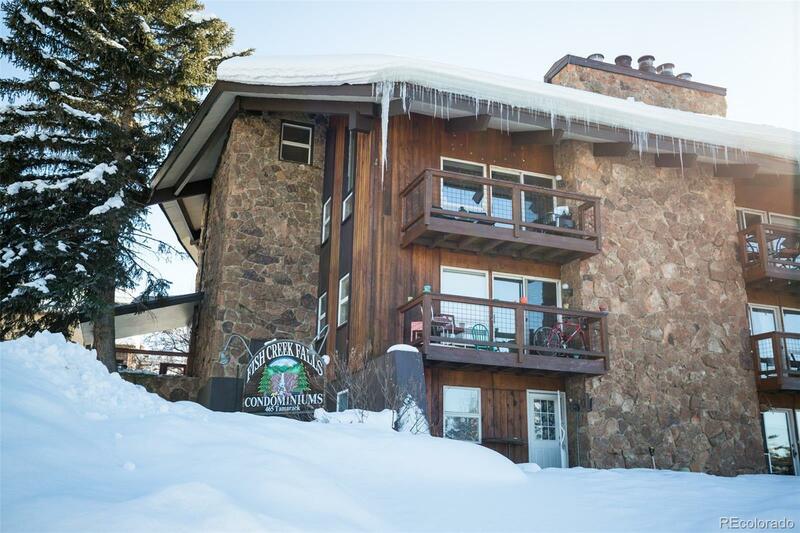 It's rare a main level condo at Fish Creek Condos hits the market - and the best part is that this one is priced so you can add your own touches! New carpet and paint will make this condo shine. The open floor plan between the kitchen and living room space allows you to cook and entertain guests at the same time. The large sliding glass doors let in natural light and lead to the spacious grilling/chilling deck. As the owner, you will have the opportunity to add a gated-off step from the parking lot to your deck for even easier access to your condo. Expand the bedroom and make it even larger or add a second bedroom for guests or a renter. At the entrance to the building, owners have ski storage lockers for easy grab and go storage. Short-term and long-term rentals are allowed.